Winter is coming, and that means it’s time to talk about your small dog’s winter weather preparedness! If your pup is small and sensitive to the weather, then he or she feels the changing temperatures just as harshly as you do. 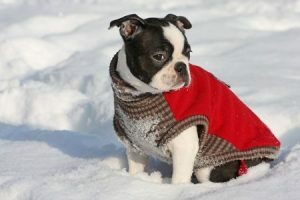 If you’re shivering and needing a coat and scarf, chances are that your pup is uncomfortable out in the elements, too. The first thing you can do to keep your pup warm during the winter months is to leave their hair a bit longer. Don’t trim their fur as frequently, since a thick layer of fur will help to keep them warm. But, make sure to comb out any knots, since matted fur doesn’t insulate as efficiently as clean fur. Speaking of cleaning, make sure your pup is completely dried after a bath before you let him or her out to do their business, and never bathe your pup in cold water. When you come inside after a walk, check your pup’s paws for cracks and cuts, and apply a little Vaseline to any affected areas. If your pup’s paws are very susceptible to cold, wet conditions, you can use dog booties to help protect their sensitive pads. Make sure to also clean off their paws frequently, especially if they walked across pavement as the chemicals used in salt and snow removal can be very harmful to your pup’s paws. In addition, you should take shorter outdoor walks to avoid freezing cold or wet elements, and focus instead on indoor exercise and activity. Keep these tips in mind and you’ll be making summer plans for you and your pup in no time!